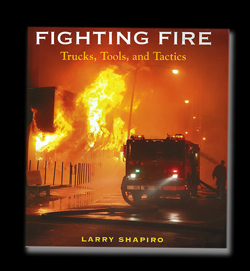 Fighting Fire is a hard cover coffee table book which focuses on the many different facets of fire fighting. 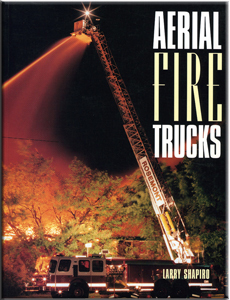 This book discusses urban, rural, suburban, wildland, industrial and the specialty types of rescues that modern day firefighters need to master. The book is filled with informative text and descriptive photos. Many of the photos were taken by other photographers from different areas of the country to supplement my own. 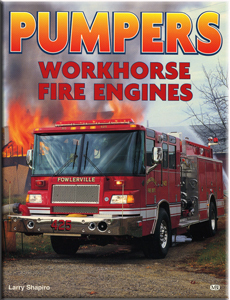 Pumpers is a modern history depicting the evolution of pumpers or engines covering the 1950s through the late 1990s. All of the major fire truck builders and many of the smaller companies are represented. The changes and introductions are explained by year with many images to illustrate the text. Most photos are in color and there are on-scene images showing them at the fireground. 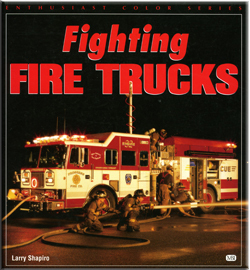 Fighting FIre Trucks introduces the reader to the fire service. The vehicles and the men and women who put them to work everyday are described in great detail along with 96 pages of full color images featuring the rigs in action. 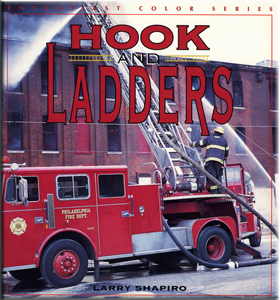 It's also a great book for anyone who loves the fire service as much as I do. Aerial Fire Trucks mirrors Pumpers depicting the modern evolution of all the different types of aerial dervices used by the fire service. The book begins with a brief account of the early 1900s and then concentrates heavliy on the years from 1950 through 2000. Many images were created for the specific manufacturers to advertise the units when they were designed. Dramatic on-scene action photos are also included. Hook & Ladders continues the information from Aerials that is specific to tractor-drawn aerials (TDA). The design evolution, innovations, use of and attributes over and above other devices is thoroughly discussed in this book with just under 100 all-color images. Thought by some to be a dying breed, this book highlights the resurgence and resilience of the TDA in many parts of the country. 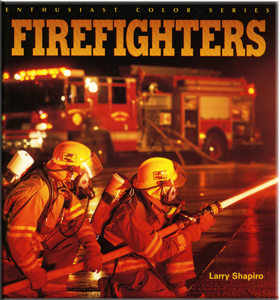 Firefighters is my first book that is not primarily about the vehicles. It was time to devote more attention to the men and women of the fire service and to highlight what they do, who they are, and try to explain why they do it! This was another opportunity for me to try and make a contribution to thank so many people that are always on-call to come to the aid of anyone in need. In case it is not yet obvious, I enjoy trucks. Big fancy work trucks to be exact. Tow Trucks in Action is another example of my fascination with a different kind of specialty vehicle. Upon seeing one of Ernie's big red Peterbilts at a recovery scene, I approached the publisher about a book featuring these big rigs working, instead of another book of static truck shots. I traveled around the country hooking up (no pun intended) with many big private towers (that's toe-ers) and many unique public agencies that provide towing services. It's really an interesting book if you can still find a copy. 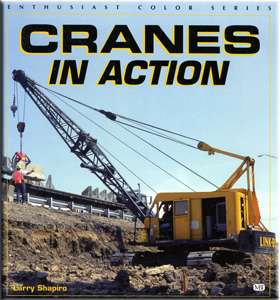 The idea behind Cranes in Action came from an episode similar to the one that inspired me to write about tow trucks. I was passing the site of the Park Hyatt in Chicago one cold winter day and saw a fascinating piece of machinery boring deep holes in the ground for the supporting structure of the new building. I then realized that different shapes and sizes of cranes were everywhere I looked. 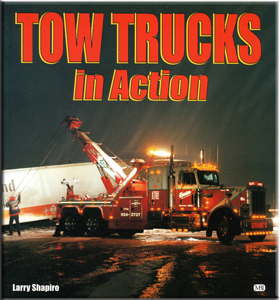 The book shows many interesting applications throughout the country and even includes a tow truck and a fire truck. It's a great representation of small, medium, large and enormous cranes ... you guessed it, in action. Special Police Vehicles for the first time allowed me to venture outside of my many years with the fire service. Quite frankly, I saw the NIPAS EST at a barricaded subject incident and thought that the team truck they had was very cool. 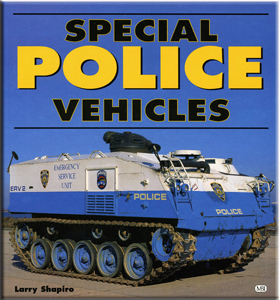 It made me want to further investigate the non-patrol vehicles of law enforcement. Many major and several smaller police agencies agreed to work with me and let me photograph their vehicles while learning about their work. This book highlights many vehicles from coast-to-coast that are ever more important in the current climate of terrorism.